The second stage of the Finnmark trip (click here for the first part, the forest trek) consisted of a re-supply stop in Karasjok. I’d intended a quick in-and-out visit before heading east, but the place turned out to be so nice I extended the stop a little longer, look around the town, and camp up on one of the fells overlooking the valley. View of the town along the river. The settlement sits on the upper slopes, above the trees. The conical building on the upper right is the Sami Parliament building. A closer view of the Parliament building. Looking out over the town from the Parliament. 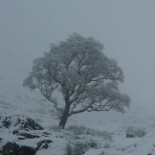 I hiked up to one of the fells in the woodland to the south of the town, to spend a night there. The views were impressive, stretching from the Finnish border to the south to the mountains around Stabbursdalen in the north, and Rasttigaisa fell in the east. Finally, I took a visit to the Sami Museum. It’s a nicely laid-out repository of artefacts, that helps give a good feel for Sami culture. It contains a couple of particularly fine examples of shaman’s drums, replicas of originals dating back to a period not so long ago when the religion of Lapland remained largely pagan, a fusion of Siberian and Nordic elements distinctive in nature. This entry was posted on October 14, 2018 by williamayoung in Fennoscandia, Scandinavia.